For the longest time I have been fascinated with the evolution of the Chicago music scene. It has been the foundation for so many strides in both mainstream and underground music. Most recently, from Scattered Trees to Redgrave or from Panther Style to Honey & the 45s and now to Ariada, the Windy City is lighting up the underground like an audio aurora borealis; it is unpredictable, captivating and cannot be ignored. I’ll be the first to admit that a “soul pop/rock” band from Chicago would almost seem a dime-a-dozen, but that isn’t the case. Maybe it is something in the water or an unbridled level of tenacity that keeps churning out attention grabbing sound. I’ll leave that up for debate, but the one fact you cannot argue is that Ariada is unlike anything else. For the first two minutes of the lead track (“Keep it Together”) of their self-titled EP, I was trying very hard to, well, keep it together. The balance of Albert Amey’s bass/guitars and Michael Tassone’s drums seethe the essential chemistry to maintain anything containing the term “soul music” and they do it with unflinching natural ease. But then you throw into the mix Brian Weinert and Lesleigh Arratia; which, by just simply listing their names, feels like a grave understatement. But it is not their guitar and vocal abilities (respectively) but the way all four complement each other and leave you with an appreciation for the collective whole. At the two minute mark, Ariada elevates to a level of superiority that is just astounding. Their vision, incorporating tearing guitar solos and unexpected get-up-and-move core, takes what would be a five track EP and transforms it into one hell of an entertaining ride. No two tracks are the same. “Blue & White Dress” stands in an aura of sultry vintage Chicago before launching into a soul inspired tango. Is that even a thing?! “Running in Twos” grooves with the meanest retro vibes. “What Mama Told Me” becomes a sort of Trans-Siberian-Jazz ditty that will get your feet moving; if you weren’t already up and blazing around your living room. And then “Rescue Me” becomes a shattering anthem of grace that is nothing short of stunning. The tasteful yet almost raunchy tendencies of Ariada are exactly what I would expect from any band laying claim to roots in Chicago. What I couldn’t expect is just how provocative and undeniable just five tracks could become. Fans of soul, jazz, music, whatever, make this a priority. This entry was posted in Reviews and tagged Albert Amey, album, Ariada, Brian Weinert, CD, Chicago, jazz, Lesleigh Arratia, Michael Tassone, soul, stream by Greg. Bookmark the permalink. 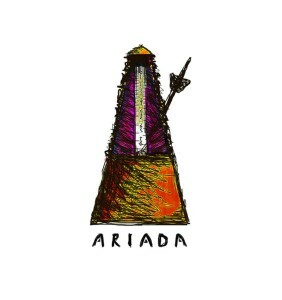 A friend told me about ARIADA and I downloaded their EP I was just impressed I was BLOWN-AWAY this band is so different and their vocalist is better than anyone I’ve heard in the last 10 yrs….I’m from Oregon and I can’t wait for this band to start touring keep up the GREAT word ARIADA you guy’s ROCK!!!! !